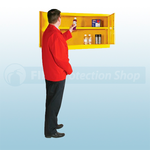 Our Wall Mounted Hazardous Substance Cabinets are ideal to use where floor space is limited. The cabinets comply with the Highly Flammable Liquids and Liquified Petroleum gas regulation 1972 and, where appropriate, the Health and Safety Executive Guide HSG51 and DSEAR 2002. The doors are reinforced to prevent distortion and are fitted with a 3-point lockable handle (2 keys supplied). The cabinet features an adjustable galvanised shelf and integral sump base to catch accidental spills.